Sydney Russell Sixth Form offers a wide ranging curriculum that allows students to progress onto Higher Education, Apprenticeships and employment. The curriculum offer enables students to study subjects that are varied and enjoyable, and can enhance their opportunities and career prospects. The formal curriculum and extracurricular opportunities of the Five Schools Partnership is intended to have a positive impact on student’s personal development, behaviour and welfare. 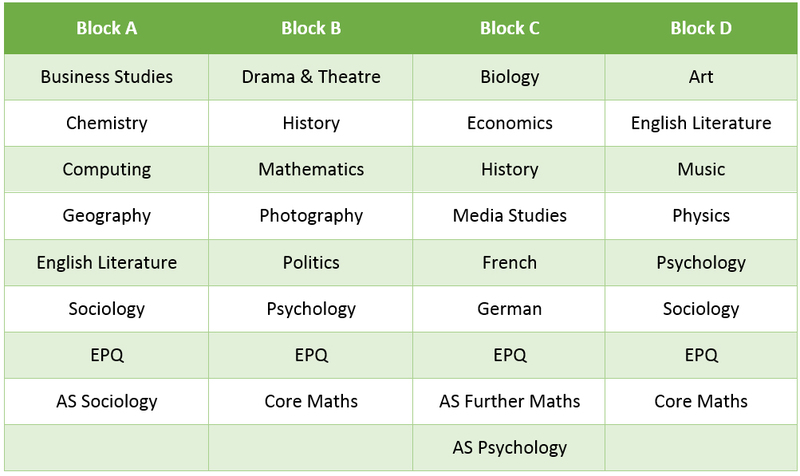 There is a wide range of subjects and study programmes offered and these include level 3 academic and vocational programmes as well as level 1 vocational programmes. The level 3 programme of study is intended to enable aspirational progression to Higher Education or Higher Level Apprenticeships. The level 1 programme of study is intended to enable students to progress onto appropriate employment or level 2 studies, with emphasis on life skills and preparing students beyond education. The enrichment curriculum develops leaders of the future through its varied programme of extracurricular and pastoral activities. It gives ample opportunity for students to develop their own sense of character and breeds a positive culture of philanthropy through connection with social issues around them. It also has a focus on health, both physical and mental, providing students with the skills of resilience and empathy preparing them for life in the 21st century. The curriculum structure facilitates students to be able to follow a range of future career pathways including medicine, Law, architecture and the creative industries. Information, advice and guidance is provided to students through specific programmes within the curriculum that enhance employability skills and ambitious advancement.